I’ve been through screen after screen of information, complimented by an intermittent personal history in platform development and fully comprehend the “power of the screen”. Everyone has the information. It is of greater interest how the information is displayed. Face it, we all have access to more data than we need. Give me the data I want to see and that is exactly what AMS DeltaPrint (c) tools do. AMS presents information in a clear, unambiguous manner giving instant visual decision-making traders with tools that work. This SnapShots article illustrates a “buy signal” for a Soybean trade. Without expanding upon the background work that brought this commodity into focus let’s look at the following “MarketDelta” and “MarketProfile” snapshots. 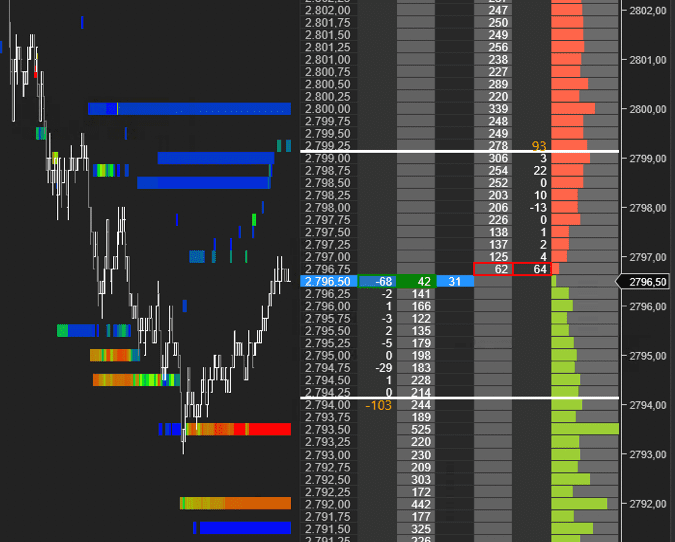 In MarketProfile, on a fifteen (15) minute setting, the volume concentration around the 884.00 level is obvious. To “old timers” like me a break above 884.00 would provide a great higher level of support above 881.00 making it a bit easier to hold positions overnight or even longer. In MarketDelta, on a twelve (12) point reversal setti9ng, is one of my favourite tools. In this “snapshot” one of my favourite AMS DeltaPrint (c) tool provides the signal. Across the bottom of the screen shot “Delta” and “DltaDay” clearly present real time information showing that the Soybean contract is absorbing sellers at the 881.00 level. The volume at this level should have pushed prices lower but “Delta”, even though slightly negative says “buy” . . . and we did.